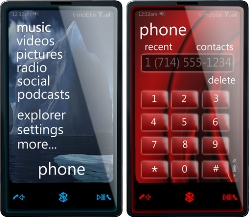 Coming In June: ZuneHD … Or A Zune-Specific Phone? Update: turns out it was a fake Twitter account, so fortunately Microsoft didn’t link to it on their official website or anything … except, of course, that’s exactly what they accidentally did. Doh. Right after that one, there was another cryptic one about Zune, of which I’m not entirely sure what it has to do with Office exactly. It read: “June 2009 will be an important month for Zune lovers”, and was followed by another one that asked some people who expressed interest on Twitter that it concerns a ‘new product launch’ and that they should ‘hold off from buying an iPhone or Palm Pre’. Neowin is considering this to be either a hint for a new (HD) version of Microsoft’s media player (which CrunchGear confirmed was coming this year) to be announced next month at E3 Expo, or the introduction of the much-rumored Zune Phone, a touch-screen multimedia cellphone Microsoft was reportedly working on together with Verizon. Fact is no one knows for sure what’s coming, but Microsoft has in the past made it abundantly clear that it wasn’t planning on entering the mobile device manufacturing market with a proprietary device, and that it wasn’t building a Zune-specific phone. That doesn’t necessarily mean it’s actually never going to happen, but I wouldn’t put any money on something like that being introduced next month. More likely, devices equipped with the latest versions of Windows Mobile will be extended with software that tightly integrates with Zune services (a project code-named ‘Pink’) although Microsoft could also plan the announcement of a major distribution partnership with carrier Verizon, despite rumors that the latter is also in talks with Apple for an iPhone contract when the current deal with AT&T expires. Or both. Or something else. Or maybe MS says June will be important for Zune just because it has a nice ring to it and they simply really don’t want you to buy a Pre or iPhone .